HMS York was the first of two York-class heavy cruisers built for the Royal Navy in the late 1920s. She mostly served on the North America and West Indies Station before World War II. Early in the war the ship escorted convoys in the Atlantic and participated in the Norwegian Campaign in 1940. York was transferred to the Mediterranean theatre in late 1940 where she escorted convoys and the larger ships of the Mediterranean Fleet. She was wrecked in an attack by Italian explosive motorboats of the 10th Flotilla MAS at Suda Bay, Crete in March 1941. The ship's wreck was salvaged in 1952 and scrapped in Bari.HMS Exeter was the second and last York-class heavy cruiser built for the Royal Navy during the late 1920s. Aside from a temporary deployment with the Mediterranean Fleet during the Abyssinia Crisis of 1935–36, she spent the bulk of the 1930s assigned to the Atlantic Fleet or the North America and West Indies Station. When World War II began in September 1939, the ship was assigned to patrol South American waters against German commerce raiders. Exeter was one of three British cruisers that fought the German pocket battleship Admiral Graf Spee later that year in the Battle of the River Plate. She was extensively damaged during the battle and was under repair for over a year. 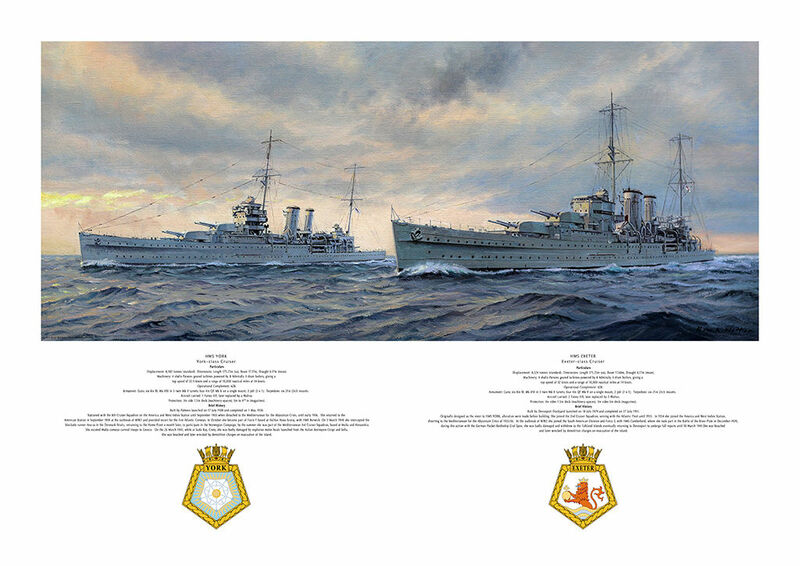 The painting shows the two during a rare meeting in the 1930s, and was commissioned by a naval art collector from the UK.